More Pacific island #COP23 Opportunism | Watts Up With That? 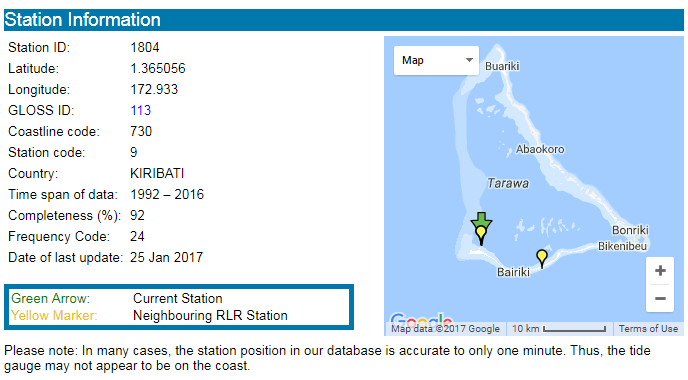 The Permanent Service for Mean Sea Level (PSMSL) database shows that the only tidal gauge currently operating in Kiribati is at Betio (Lat. 1.365 S, Long. 172.933 E), on the island of Bairiki, which is ENE of Nauru, almost due north of New Zealand. The gauge has only been operational since January 1993 and the first two years can be ignored because data is missing for nine months of that period. The trend in monthly average sea level at Betio from January 1995 to December 2016 shows a rise of 4.7mm/year, which is almost three times the global average calculated from tidal gauge data. Sea level at many Pacific Islands rises and falls according to the El Nino-Southern Oscillation. The strong El Nino of 1997-8 saw sea level at Betio fall about 250mm and only slowly rise back to its old level. With this event so early in the sea level record the relatively high trend is hardly surprising. Skipping the period of the El Nino and the slow recovery and calculating the trend from January 2000 to December 2016 shows just 1.9mm/year. At that rate it will take over 50 years to exceed 100mm, which is about the width across the palm of an adult male’s hand. A mass exodus due to rising seas to Fiji or anywhere else any time soon seems highly unlikely. The sea level response at Betio to the 1997-8 El Nino was very unusual because most El Nino events cause a rise rather than fall. In fact sea level at Betio corresponds very well to the Nino 3.4 ENSO index of about three months later. The close relationship between sea level and the ENSO indicates that the ENSO is the primary driver of Betio’s sea level. This of course is hardly likely to stop the Kiribati government claiming otherwise and begging for money, such is the attraction of supporting the UNFCCC’s beliefs. While researching the reports of rising sea level it was found that the data for Pago Pago (American Samoa) has an upward step in 2010. A check of GPS data from the Nevada Geodetic Laboratory (see http://geodesy.unr.edu) reveals a gradual fall at station ASPA, near the Pago Pago airport, that began in that year and still continues, being about 120mm at the present time. It appears that the PSMSL data for Pago Pago has not been corrected for the fall in the tidal gauge. Tidal gauge data for Honolulu also seems in need of adjustment, which raises the question of how much PSMSL data is in need of correction and the impact those adjustments might have on the global average sea level trend. November 9, 2017 in Climate News, Sea level. What’s not to love about that for the Kiribatians? Those cargo planes should be landing any day now… stuffed with Western cash. Please read my article on this issue in conjunction with John’s observations. That sea level gauge chart looks lumpy, but the start and end point are nearly the same level. What sea level rise? 4.7 mm/yr x 22 yrs = 103.4 mm. Eyeball it. Starting Jan 1995 to Jan 2016 (22 yrs) it starts at around 6850 mm and ends at around 6950 mm, or about the 100 mm from the trend. The start point is the problem as John pointed out. Just as the satellite-era Arctic Sea Ice records start in 1979 at a high point and allows an exaggerated trend line downward, this short PSMSL record also has an exaggerated trend line upward. There is a starting PMSL dot at 6950mm. As Tom Halla points out, there is not a trend. Nor should something be declared to show a trend when even short periods exhibit positive and negative movement. Especially when dealing with natural effects subject to long, currently incomprehensible cycles. For an expose of the explicit UNFCCC ‘small island’ gamesmanship behind this part of the climate movement, see 2013 essay Caribbean Water at Climate Etc. Sea level rise tangled together with drought to extort mythical green climate funds. Isn’t it interesting the new large projects that appear when doing a short research post. Who is going to investigate the tidal gage data. Seems we may need a program like the Surface Station program from a few years ago. But remember, all us here in the US are ‘selfish and stupid’ if we don’t just cough up the money when it’s demanded by the entitled. Just a word about Kiribati. When you ‘sound’ the name in your head or say it, note it is pronounced ‘Kiribas’. I was at the UN (as a visitor) when Kiribati was the latest to join the UN and the tour guide (when I suggested quietly what the pronunciation was) looked at me as some idiot foreigner and continued to say ‘Kiribati’! I remain amused at the hysteria about SLR. Here in NZ we are getting more local government panic about SLR affecting coastal housing and we get great reports about how places on the shore of Wellington Harbour (or Harbor) will be soon inundated. This ignores the fact that our geologically regular earthquakes (every 50 to 100) years raise the Wellington area many times the alarmist modelled SLR . Our airport was once at and below sea level (and then not an airport!) and a main coastal road (the Hutt Road) was able to be built when the sheer cliffs suddenly had a shoreline shelf to put a road on (two earthquakes 1845-55). Reality, facts and history never seems to confuse the minds of panic merchants. It is worth pointing out, Ricco, that the sea floor around Kaikoura NZ, which was very close to the epicentre of a major earthquake on 28 November 2016, rose by up to more than 2 metres. The whole northern part of the South Island was lifted. It’s what happens when tectonic plates move! The same is true of the South Pacific Islands monitored by the PSMSL project. They, and NZ, sit on the Pacific “Rim of Fire”. Given that NZ is often called “The Shaky Isles” I have to wonder why NZ is becoming the target for “climate change refugees”. I would have thought 3 major earthquakes in the last 10 years would put anyone off—except for those of us who live there (and through the earthquakes)! If they would just hold an underwater cabinet meeting, I bet they could really get the ball rolling. I love the smell of $$$$$$$$$ in the morning. I’ve discussed this question in a post called “So Many People … So Little Rain“. Pour yourself a great big tall glass of Shut Up Juice. Don’t you realize these people stand to make a ton of money for doing nothing?? But in the end if the money is paid out it will be because we have lame brained swamp critters making the decisions for us. And then we still re-elect them. Isn’t bizarro world a wonderful planet on which to live. The problem with hanging out a carrot in the form of free money is that you basically get honest people starting to lie about a problem that they soon start to believe is a real problem, as other people at global climate change conferences tell them they are about to sink under the waves. Can’t really blame the Islanders for wanting free money when all the eco-loons tell them they are soon to be climate refugees and there all this money available for the plucking. The 2nd world is technically the former USSR and China, plus a few other soviet satellites. 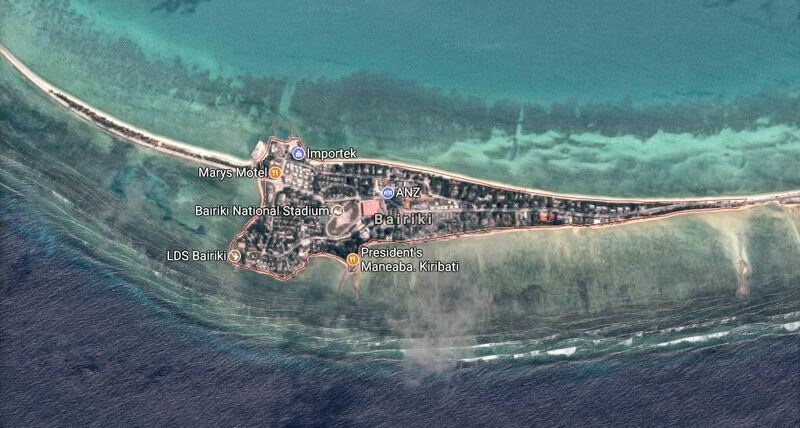 Look at Kiribati on Google Earth. It’s basically a series of coral atolls, but a lot of the islands look like sand bars from their morphology, presumably coral debris washed along the shore by wave action. A large part of Kiribati could get washed away in a major storm, and this would have nothing to do with SLR or AGW, but of course these would be blamed anyway. The big surprise is that the islands on the south side of the triangular atoll complex are totally built over – wall-to-wall houses. If that big storm does come, there will be a lot of people with nowhere to go. The sand-bar causeways between the three main islands would be the first to get washed away. I wonder to what extent building roads and houses will impede the ability of corals to grow upwards as sea level rises. It’s hard to imagine corals thriving and growing to meet sea level if there’s concrete in the way. Of course, that’s not part of the story; it will be “corals couldn’t keep up with accelerated SLR due to AGW”. I can almost write it the story now, it’s so predictable. Leftiepedia is a lying toilet of a website. Bring it down. I wonder to what extent building roads and houses will impede the ability of corals to grow upwards as sea level rises. It’s hard to imagine corals thriving and growing to meet sea level if there’s concrete in the way. What? Coral sand “grows” under water, so existing coral islands are always temporary in the sense they need waves and wind to push more sand of top of the old. I have a feeling of great discomfort over the AGW claims about sea level rise and there is much discussion about it in a forum John and I both subscribe to. That is compounded by concerns about how any grant monies are to be applied or diverted to other uses. I haven’t read the Paris Agreement (has anybody?) and it is unclear to me how the expenditure of monies available is supposed to be controlled. Is there a prescription? Are there binding definitions/regulations which would preclude corruption? Would someone who has studied the agreement enlighten me please. Preclude corruption? Why on Earth would you want to do that? 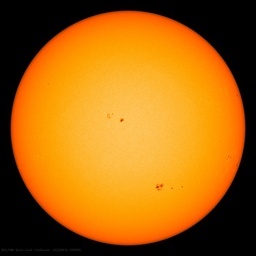 This is the climate change fraud we are talking about. Emphasis on the fraud. Hivemind, can you answer my question? If not, why did you bother to comment? I used the the word “preclude” because, contrary to what appears to be your point of view, not everyone concerned about climate change is corrupt. Misguided as they might be, some of these people genuinely believe they are in danger. I would like to know how much has been prescribed to prevent corruption by those who would like to profit from that genuine concern. The sea level response at Betio to the 1997-8 El Nino was very unusual because most El Nino events cause a rise rather than fall. Could you illustrate that by plotting the two. It does not appear to be the case from a quick visual inspection. See update at foot of article. If you want a good laugh read this ! I find it disconcerting that it’s difficult to find photographs of these ‘threatened’ islands from a few decades ago so that visual comparisons can be made with Google Earth from ‘today’. Doubtless their crop yields are up though. Maybe it’s time to start applying an agricultural productivity tax for all the free plant food donated by the West. This is quite natural, during a Nino the Eastern Pacific heats up and the Western Pacific cools down and the westerly winds increase as well. PSMSL could mean P!Sing MySelf Laughing, surely not! There has been tide gauges in Kiribati since 1949, with sufficient overlap to produce a long record with indicating trend. As far as I can tell, there has been less than 1mm per year rise in sea level over this longer period. All of these shorter time frames for sea level rise are totally insufficient to deduce any long term pattern what so ever. Am I reading the graph in the footnote correctly? 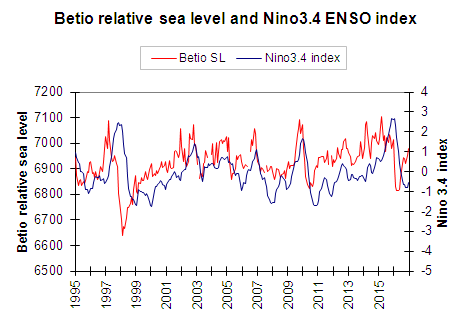 It looks like the Betio relative sea level is a LEADING INDICATOR for Nino3.4 anomaly!!! Can somebody with stronger math skills than me crunch the numbers for a correlation and lead intervall? Anything that could reliably predict Nino3.4 by a few months would be awesome for short-term global climate forecasting. This is one gauge. There may be others on the planet with an even better correlation. Or maybe use a “composite index” of multiple gauges. This sounds like a worthwhile research project. The Nino 3.4 index is mean of 3 months rolling average SST anomalies. I think your lag is partially to do with this averaging process. The other likely issue is that surface SST anomalies are preceded by deep water anomalies. This will alter sea level from thermal expansion and retraction prior to any surface temp anomalies emerging. I commend you on not using the enye letter/character in this article. It has annoyed me since this weather phenomena was rediscovered and then explained by science (I think in the early 1990’s). If we are going to adopt it into the American English language, we shouldn’t add to our 26 letter alphabet. Two examples are canyon and pinyon, though the latter, like “the Ninyo”, will be incorrectly pronounced forever. Only those with a Spanish accent pronounce it “peenyon”. The spelling would change from Spanish, but it is pronounced Neenyo. “El” is similar to our “the”, though a noun’s gender isn’t needed. I guess I should have spelled it “peenyone”, like “condone”, but it still would get pronounced correctly. Maybe “peenyoan”?, like “loan”? Why doesn’t “lone” rhyme with “one”? Why is “one” pronounced like “won”? Tide gauges with long observations is very interesting. You can see a wave pattern hard to explain with CO2. The records of the Australian Bureau of Meteorology over nearly 30 years so almost zero rise on Kiribati, Tuvalu, Fiji.